Barcelona airport has two terminals. Terminal One is the nice, shiny new one and caters for proper old-fashioned airlines that provide things like meals and customer service. Terminal Two is its grubbier, older sibling, which welcomes the airlines who shout at you and sell you scratch cards. I admit to having much more experience of Terminal Two. 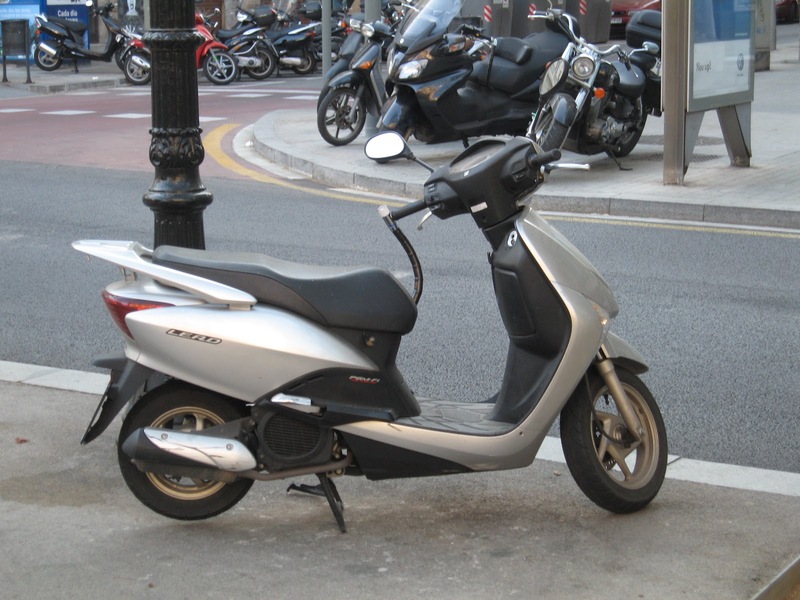 Getting to the centre of the city from either of the terminals is quick and easy. I would recommend the Aerobus as they depart conveniently from right outside each terminal at regular intervals (every ten minutes for Terminal Two, every five for Terminal One) and get you into the city centre in less than half an hour. You can buy a ticket directly from the driver - €5,25 for a single, €9,15 for a return (the return part has to be used in the next nine days). 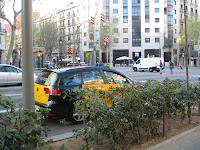 There are only four stops: Plaza Espanya, Gran Via – Urgell, Plaza de la Universitat and Plaza Catalunya and almost everyone will be going to Plaza Catalunya but someone often gets out at Plaza Espanya by mistake. Laughing at them is optional. Do enjoy the really bizarre English accent they’ve picked to announce the stops for us tourists. I think it’s a rare example of Catalan satire. So I'm out of train photos. Sue me. You can also get a train from Terminal 2 (there’s a free shuttle bus from Terminal 1 to Terminal 2) but I never have so I don’t see why you should. It is cheaper at €1,70 but it doesn’t go as often (every half hour) and it doesn’t reach such central destinations going instead to the rail/metro station at Sants and the Passeig de Gracia. 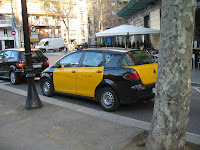 A Barcelona taxi. Note colours! Finally, if getting directly to where you are going without hassle is important and you are richer than me then you can get a taxi. 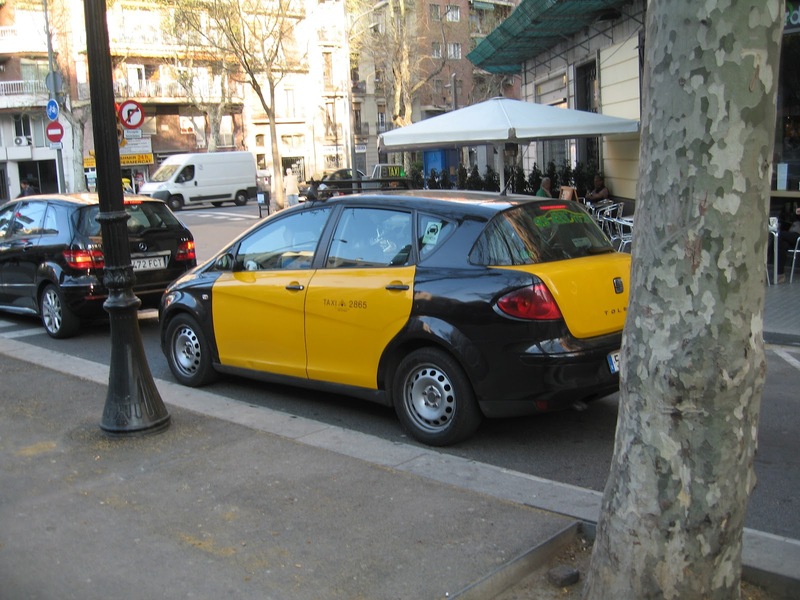 The taxis are directly outside the terminal and are a distinctive black and yellow. If you get into a taxi and it is not black and yellow you have probably been kidnapped. A taxi journey should cost about €30 into the city centre unless you have in fact been kidnapped in which case it will presumably cost considerably more. Not to mention one or more of your fingers if your close relatives are stingy. Lots of Barcelona’s roads are very long so the convention when telling taxi drivers where you want to go is to tell them to go to the nearest cross roads so it’s worth looking it up on Google maps before you go though I’m sure they’ll muddle through if you just give them the address (though it may cost you a little more). 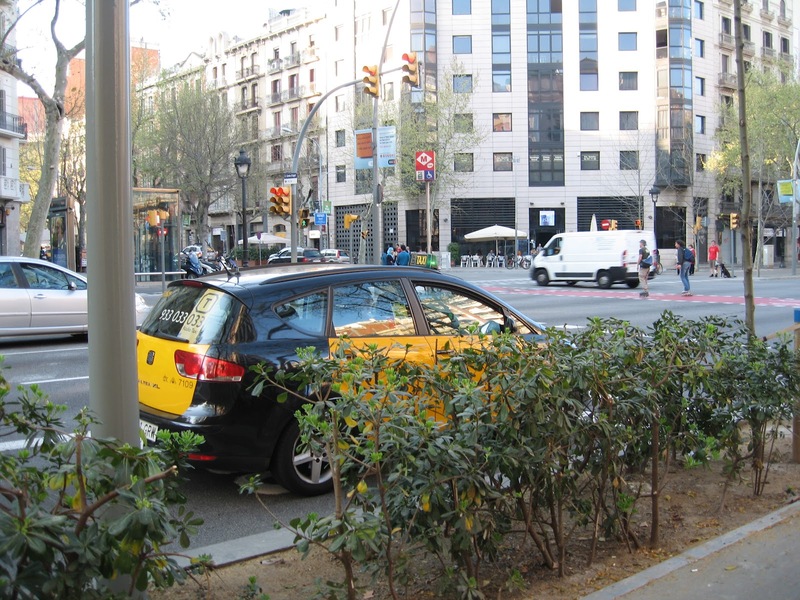 Big tips are not expected in Barcelona – a one euro tip on this journey is more than enough. A taxi hiding behind scrub. Still easily recognisable. 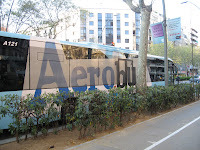 ¿Dónde está la parada del auto/Aerobus? – Where’s the bus stop? Un/Dos/Tres/Cuatro/What are you a football team billete(s), por favor. – One/two/three/four tickets, please. Quiero/Queremos ir a.... ¿Cuánto cuesta? – I/We want to go to….How much does it cost? Dios mío, hace calor – My goodness, it’s hot. ¡Aí! Tenía miedo que fueras antes de que pudeira subir – Phew! I thought you were going to go before I could get on. Qué bueno el autobus/tren/taxi – What a nice bus/train/taxi! ¿Eres secuestrador? – Are you a kidnapper? So you’re here. Next we’ll try and find something for you to do.